Hi. Greetings from Hungary. Thank you for sharing your nice works. 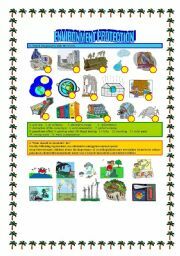 I hope you like my printables and powerpoints. Matching exercise. 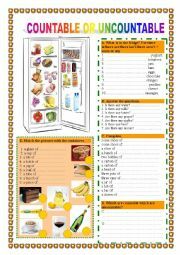 You can find 24 verbs related to cooking with pictures. 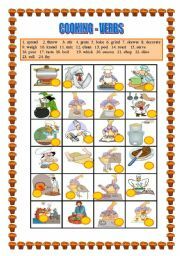 I had printables (cook-verbs domino(16 nov 2008), cook-verbs (15 nov 2008)other exercises) on cooking with the same pictures. You can find various exercises here. There is/there are, some-any, cointainers, countable/uncountable, etc. You can find four various exercises here. 1. Match the buildings with the pictures in the map. 2. Give advice where sb should go to. 3. 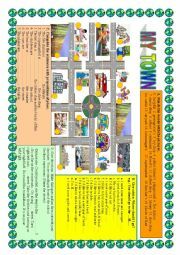 Use prepositions of place 4. Make dialogues with the help of expressions - topic: giving directions. 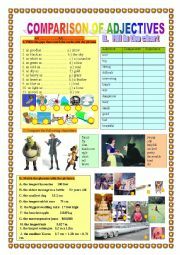 You can find various exercises here related to the topic of comparison of adjectives. 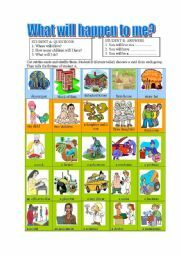 1. as...as... complete, match; 2. fill in the chart with comparatives and superlatives 3.compare the characters using adjectives from the boxes, 4. world records matching - interesting facts. I hope you like them. Have a nice day. Look at the chart. Who has to do the jobs? e.g. Petra has to cook the lunch. Then match the household chores with the pictures. 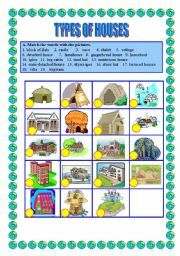 Fortune telling game: 3 types of cards:house type, number of children and jobs. Cut out the cards and shuffle them. Student A asks questions-Where will I live? How many children will I have? What will I do? Student B (fortune teller) chooses a card from each pack and answers-You will live in a ........., etc depending on the cards. 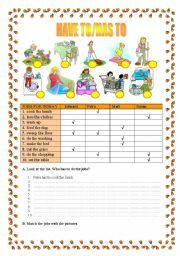 You can find various exercises related to the topic of school subjects here. 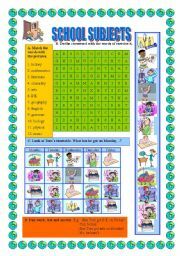 Matching, crossword, timetable-ask and answer, pairwork. It�s a good game. 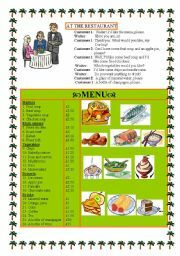 Help the waiter to choose the right dish based on the order(sentences are at the top of each page). E.g. : I�d like some chicken soup and some spaghetti bolognese, please. Wrong choices are deleted. Right choices go on the table. I hope you like it. It�s a game. Read the sentences at the top of the page then click on the right shop. Wrong choises will disappear. If you choose the correct picture a girl or boy will go there. e.g. : My mum wants some vegetables and fruit. I have to go to the greengrocer’s. FOR OR SINCE? How long ....? You will see a question at the top of each page and several answers without �since� or �for�. Students have to decide on the right choice then you can check the answers if you click 5 times on the actual page. I hope you like it. You can see a shopping list on both pages. If you choose the right product it goes into the shopping bag. I hope you like it. I worked a lot on it. It�s a game. You have to click on the necessary ingredients. Wrong choices will disappear. Right ingredients will get into the witch�s cauldron. I hope you like it. Easter-What is the bunny doing? It can be used not only at Easter. What is the bunny doing? Look at the pictures then choose from 3 answers. Click on the egg to continue. I hope you like it. Where is the ghost? Click on the pictures and you will see what is hiding under them. Questions are given. I hope you like it. Click on the body parts to create a monster. Then describe your creature. e.g. : It has got three legs. It has got two eyes. etc.